I received a flurry of email newsflashes last week from Manchester City Football Club. First the shock news on Monday that Sven-Goran Eriksson and the club had “parted company by mutual consent,” then the follow-up formality on Tuesday that Hans Backe and Tord Grip had also left the club. The surprises continued on Wednesday when a third email informed me that “Manchester City & Sven-Goran Eriksson have parted company by mutual consent” (I think someone pressed the wrong button) before a further email 25 minutes later announced that “Mark Hughes has been confirmed as Manchester City’s new manager.” My final correspondence the following day announced that Hughes had just given a press conference, and then it all went quiet. It had been quite a half-week. A lot has been said about the Sven situation, and I was obviously agin his dismissal, but I decided to keep my powder dry, for everything to be settled before I said my piece. Then, a 5th birthday party and a 6th wedding anniversary intervened, diverting me (in the nicest possible way) from finishing this rambling, overlong discourse, but here it is now anyway, for what it’s worth. First of all, despite the current well-aired criticisms of the sacking (yes, sacking) of Sven, it is worth saying that when he arrived he was not universally welcomed. I don’t think there was much outright antagonism, but there were quite a few misgivings from many City fans bearing in mind his reputation as England manager. In the end there was generally a wait and see approach, accompanied with the back-handed compliment that Sven had a proven record as a “good club manager” (whatever that means) who had won trophies wherever he had been; a record that was bound to founder at Eastlands, regardless of how long he stayed there. I’d say I was happier than most at Sven’s appointment, primarily because I was less critical than most of his time at England, where I felt it was hardly his fault that his team failed to live up to the unrealistic expectation placed upon it (although there were plenty of errors during his time there that he can lay claim to and call his own.) As City kicked off the season at breakneck pace, seemingly invincible at home and pretty useful away, most reservations disappeared, and I was happy that we had undoubtedly improved upon the previous season’s shambles, but cautious that our results were exceeding the quality of our performances, and that something was likely to give at some point. Before the start of last season there seemed less talk around about the purchase of the club by Thaksin Shinawatra. There were a few grumblings for sure, but amongst the fans the majority seemed not to care about his background or the fact that here was another moneybags owner who was going to skew the league ever more in the direction of the big spenders (indeed, that constituted most of his appeal), and this opinion didn’t seem to change over the course of the season; some even cheered his allies’ success in the Thai elections a few months ago as another feather in the cap for “Frank”. Personally I was extremely uncomfortable with his involvement, in part because of the allegations of corruption and human rights violations that hung around him, but also because I don’t like this trend towards ever deeper pockets buying success in football, even if it is currently our good fortune to be one of the beneficiaries. You will never get perfection I know, but I would prefer for us to be moving towards a situation where a club’s success was mainly down to appointing a canny manager who could handpick promising, talented players to blend a team that plays in the most entertaining way. I can’t tell you how much pleasure it gives me to go to the Premier League page on the BBC Sport website and double-take when I see a Hull City hyperlink staring back at me; but wouldn’t it be even better if we thought it possible that with a few key signings they could rise up the league and even challenge for the title in a few seasons time? Instead we know they will be fighting the drop until the day they are relegated, and it seems we are heading in the opposite direction to the way I would wish, ever further towards a league where the teams that succeed are purely the ones with the with the most pounds, dollars or bahts. You could argue that it is just this trend that has led us to the situation where the Premier League is the strongest domestic competition in Europe, but who benefits? Not the majority of fans I know who couldn’t care less what happened in this years’ European Cup final. Let’s be honest though. 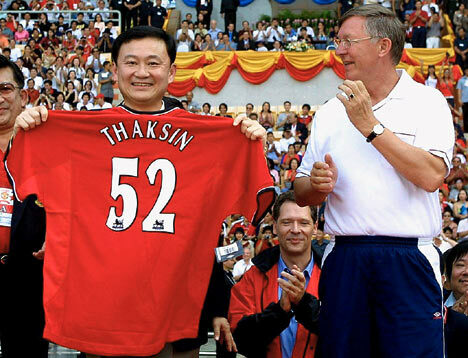 Taking last season in isolation Thaksin’s involvement has hugely benefited the club. It was his money that brought Eriksson, Petrov, Corluka and Elano to Eastlands, without his involvement we would never have finished where we did in the league. We are not the first or only club to sack a manager prematurely – indeed City are past-masters at it – but few dismissals seem as out-and-out stupid as does Eriksson’s. So thanks for last season, Frank, but since I am intending to support City until I die I am also looking to the future, and that is where I am concerned. So what of the future, and how will this episode affect it? For Sven the future looks bright; he’s not all that bothered by events I’m sure. He’s rehabilitated his battered reputation in England, received a tidy bit of compensation, and now has another new job to look forward. In all he’s probably better off out of Eastlands, he’s sorted. But what of the future of the other actors in this story? On the playing side of the club, in the immediate future there is the fact that Richard Dunne, the rock of our defence, apparently wants away; how much has his desire to leave got to do with the sacking of Eriksson I wonder – how will other players react when their contracts are up for renewal – and how easy will it be to replace someone who currently seems so irreplaceable? He certainly won’t be replaced by paying silly money to Ronaldinho just because we can as has been mooted, a deal that, if it goes through, seems more comparable to the time Melchester Rovers signed Spandau Ballet’s Martin Kemp than to an incidence of a serious football club building a team to challenge for a trophy. Before the appointment of Mark Hughes I worried about who would accept the job, and why. I have no axe to grind with Hughes, regardless of the identity of one of his previous employers, and he has a promising record as manager; but what chance that promise is given the time to further develop at City? The sacking of Eriksson itself suggests an impatient, short-termism from the owners of the club, and short-termism can breed a short-termists, mercenary strain of manager who will happily sign a three-year contract knowing that the worst thing that could happen is for him to be sacked mid-contract and to be paid off handsomely. I don’t want to malign Mark Hughes’s motivation, but if I were him and considering trading in the stability of Blackburn for the supposed risk at City it would be a no-brainer, win-win situation; he can sign on the dotted-line safe in the knowledge that in the unlikely event that he is given the time to succeed then all’s well, but no matter how badly he fucks it up and no matter how short his reign he will still get his pay-off and a ready-made excuse that his failure was down to his inability to work for Thaksin. Then he can still get a new job based on his unblemished Wales and Blackburn CV. And finally, to Thaksin himself; what has this episode done to his reputation, and what does the future hold? Well the main thing that has happened is that many of those who weren’t interested in his background in Thailand before and didn’t care what effect a monied and dictatorial owner would have on the club in particular and football in general have changed their minds. Football fans can be a fickle lot, and no one will mourn Sven’s passing or brook criticism of Thaksin if the club goes from strength to strength from here on is. But I can’t help worrying about just how many managers we may have to go through – at a potentially diminishing rate of return – in the hope that one may fluke a bit of success in their first season; and if success doesn’t come, how long before Thaksin becomes bored, loses interest, packs up and moves on? And if that does happen, where will City be then? As you can see from my name I am somewhat biased, but no one knows Sven and his history like his professional double (?) and having stood in for him (sometimes employed by TheFA) interacting with many 1000’s of fans and members of the general public, I may have a pretty good idea of the way people feel about him. You refer to “quite a few misgivings from many City fans bearing in mind his reputation as England manager”? Surely the only misgivings could be from those who only read the malicious tripe in a few red top rags? The howls of protest from official England fan organisations and the England squad when TheFA stabbed Sven in the back must surely indicate a different sentiment? Most informed football fans recognise and appreciate that (regardless of the fact that our TEAM failed at 3 quarter finals) Svennis’ leadership dragged England out of the wilderness and up to FIFA No.4 World rank, cruised to top qualifying place in EVERY international tournament and England lost only 5 competitive games during his tenure. The Sunday newspaper who’s “creative interpretation” of pretty innocuous comments and events, payed dearly in an out of court settlement for their mischief but still the myth they invented appears to have some creedence in certain quarters…. During his “gap year” Sven turned down countless offers from league clubs and national teams around the world before he took on the challenge of turning MCFC around and his 3 year plan COULD have replicated Lazio’s spectacular rise from relative obscurity. Sven-Goran Eriksson maintains his dignified silence in these matters but needed (and needs) NO “rehabilitation” in the eyes of the international soccer community who have acclaimed him as “the greatest living coach / manager” while laughing at the unpatriotic (xenophobic and suicidal?) British press and perfidious crew at Soho Square for throwing him (and England’s chances in Euro 2008) away. I join my Doppelganger in wishing the blues every future success with Mr Hughes, but England’s and City’s loss looks very much like Mexico’s gain to me? So I do feel that his reputation had taken a battering in England (wrongly in my opinion, and no doubt at odds with his international reputation) and I can understand why Sven may have wanted to turn that unfair perception around. If so then after one year at City, if people are at least prepared to accept that he is a “good club manager” then it seems a case of “job done”. It’s probably a case of “mud sticks”? Front page banner headlines accusing Sven of missmanaging England’s “Golden Generation” and the constant invasion and hype regarding the private life and batchelor lifestyle (of this unmarried man) created a false imprssion in some people’s minds, but the fact that that same “Golden Generation” reported as being “held back” by Sven, crashed in flames without him says a little about who was the principal author of England’s short run of consistancy after the rollercoaster decades of short lived hope and mediacraty? It’s odd, but the old saying that “players win games but managers lose them” in the blame game, consistantly holds true? The “what ifs” will always remain unanswered, but surely few would believe that England could be “on the bench” this summer if Sven had been allowed to see his extended contract out through Euro2008? I have met and worked with many members of the England squad past and present and have a little insight into the opinions and ideas of many of those players and officials who know and worked with S-G E and the insider view is very different to the distortions of his “dignified, warm, witty and dedicated personality” represented by some members of the media. At Manchester City, the indication is that Sven would continue using his unmatched knowledge of the world’s RISING stars of the future to build a strong team while ignoring the overpriced and fading big name players that other clubs buy to raise PR profiles and sell shirts? Not playing the publicity game but only looking at the slightly longer term cold hard business of creating a winning formula may well have contributed to some of the disagreements with Dr Thaksin and his instant gratification dictates, but history shows that Sven has an exceptionally good (unmatched?) track record but is very much his own man while also supported by his long term, tried and trusted personal assistants who so loyally move from post to post with him and add so much to his achievements and capabilities. Losing Sven also deprives a club of that mini infrastructure that comes with him as a “package” unlike most other coach/managers. You say “job done” for MCFC but it was job barely started before being undone as far as I can see? Lets see what Hughes does (if he survives “Frank’s” demands for long?) in the coming seasons? I think that the British soccer scene is going to be a less colourful place without him and it will be interesting to see how he and Mexico fare during the next few years, but I am looking forward to following him on assignments down Mexico way sometime soon as well as continuing to “represent” him in other projects in the UK and around Europe and the world…. My “job done” referred to Sven’s desire (if such there was) to rehabilitate his reputation in England. As for the rest of your comments: I think I’m on record elsewhere as saying that in my opinion the “golden generation” of English talent was nothing of the sort, and I would add that like you I think Sven should have been given more time at City, that I hope (but doubt) that Mark Hughes is given that time, and that Thaksin seems more interested in garnering publicity with moves more suited to a circus ring than a football pitch (eg. Ronaldinho), as I have said in my post. As for Mexico, enjoy any work opportunities you get out there and best wishes.